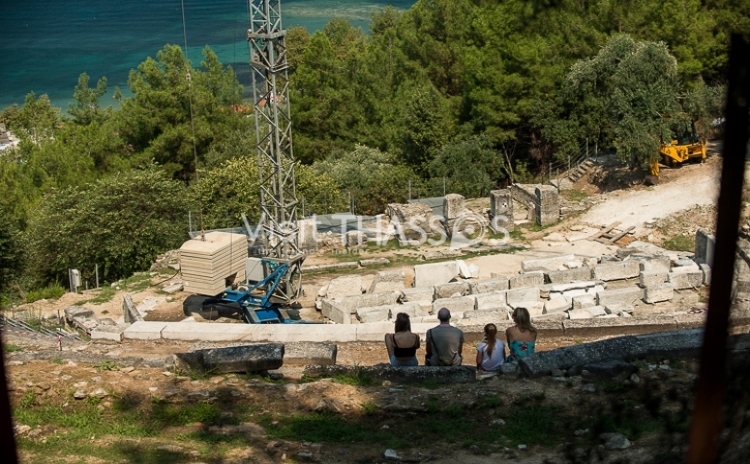 A few words about Ancient Theatre..
On the western slope of Acropolis of Thassos, on the top of a natural theatrical terrain is where the theatre is situated. Its position is a natural embrace overlooking the sea, the isle of Thasopoula and the opposite shore. The theatre leans on the ancient city wall, hence losing the absolute geometry of the hollow in the eastern side. The first excavation was conducted by the French Archaeological School in 1921 and revealed the auditorium, the orchestra, the lanes and a part of the stage. What the visitor sees is how it looked during the Roman period during which has become a venue for naval and hunting performances, hence the gallery at the orchestra and the monumental two-store stage. Access to the theatre is via a stone staircase winding from “Dionysio” the hillside and also via a natural path that runs parallel to the outer wall and leads from the port to “Evreokastro” and finally to the theatre. In recent years, the risk of fire made necessary to create a forest road leading to the monument, bypassing the hill of Acropolis. This road is now used exclusively to transfer necessary equipment for the various performances and to transport disabled and elderly visitors on site.